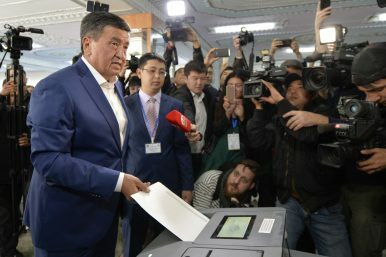 Former Prime Minister Sooronbai Jeenbekov — from the pro-presidential Social Democratic Party — has won the Kyrgyzstan presidential election, with 54.81 percent of the vote. His main opponent, Omurbek Babanov, leader of Respublika-Ata Jurt — the second-largest party in parliament — received 33.74 percent of the votes. The outgoing president, Almazbek Atambayev, pursued a coalition aimed at maintaining a balance of interests between the affluent, trade-based communities in the country’s north, and the primarily agricultural based majority in the south. Jeenbekov, a southerner himself, is recognized as “a son of the soil,” having served as Agriculture Minister and Governor of Osh, a populous province bordering Uzbekistan and Tajikistan. Effectively, the election outcome reflects Kyrgyz politicians’ inclination towards an arrangement that falls short of taking any far-reaching measures would address the existing economic and wealth disparities, reflected by the north-south divide. The succession from Atambayev to Jeenbekov also appears to be a result of the country’s leadership pursuing a skillful balancing of Kyrgyzstan’s regional relations, especially with Kazakhstan — the country’s largest neighbor to the north — and Uzbekistan, the country with the largest population among all Central Asian states, to the south. Both Kyrgyzstan and Kazakhstan are part of the Russia-led Eurasian Economic Union (EEU) — a trade bloc that also includes Belarus and Armenia. Just this week, however, Kazakhstan and Kyrgyzstan agreed on steps to ease checks on the movement of people and goods along the 1,212 km border between the two countries. The border issue arose amid accusations of Kazakhstan potentially interfering in the Kyrgyz presidential campaign. On its other border, Uzbekistan, with a population projected to exceed 33 million by 2025 has growing water needs but is increasingly wary of Kyrgyzstan’s plans to dam rivers for hydropower projects. Russia, another regional actor, also has a direct interest in the results of the election. Sharing a common past — Kyrgyzstan was under Soviet rule for seven decades — and close economic and security interests, commentators in Russia have voiced their expectations about the results of Kyrgyzstan’s presidential polls. Speaking from Moscow, Dmitry Alexandrov — an analyst with the Russian Institute for Strategic Studies — expressed that the vote affirmed Kyrgyzstan’s desire for stability, while recognizing that a top priority for the new president will be to “conduct a dialogue with the constituencies in the country’s northern districts, including Talas and Chuy.” Alexandrov, like many Russian commentators, also wishes to see Kyrgyzstan continue to maintain close bilateral ties to Russia including a Moscow-led economic and security alliance and a deepening integration with the Eurasian Economic Union. Nevertheless, while the relationship with Russia may remain strong, it is important to remember that Kyrgyzstan shares a 1,063 km border with China, a neighbor whose foreign direct investments continue to rise. The Chinese Petroleum Company funded 300 million USD for building a refinery, operating since 2013. It was envisaged that the refinery would help reduce Kyrgyzstan’s dependence on the supply of processed fuel and lubricants from Russia. Plans for ​​building a China-Kyrgyzstan-Uzbekistan railway are under discussion. When launched, Kyrgyzstan will receive a portion of the projected investment, estimated to be up to three billion USD. Moreover, Kyrgyzstan is looking for China to invest in the construction of energy facilities, especially the Upper Naryn and Kambarata-1 hydroelectric power stations in Kyrgyzstan. Hence, Bishkek will very likely, and wisely, leverage the shared economic interests of Russia and China, maintaining parallel arrangements and engaging on Beijing’s One Belt and One Road Initiative and in the Shanghai Cooperation Organization. The new administration will to need allay long-running misgivings in order to win the public’s confidence on numerous domestic and international issues. This includes addressing ethnic and regional divides, criminal activity as well as expanding commercial interests and good governance—the lack of which, at times, poses a power vacuum. Above all, Kyrgyzstan’s ruling Social Democratic Party (SDPK) made a commendable choice to seek wider endorsement from the public, thus, marking a clear departure from previous practices where a narrow but powerful circle selected their favorite candidate to rule. The intending message is clear: among all Central Asian states, Kyrgyzstan has pursued the path to democratic transition — a commitment which merits further consolidation. The onus now rests on the tri-partite ruling coalition to rise decisively above petty politics to ensure much needed stability. Najam Abbas is a Senior Fellow for Central & South Asia at the EastWest Institute. This article has previously been published on the EastWest Institute Policy Innovation Blog. As some voters celebrate the conclusion of the vote, others vent frustration with government pressure and broken systems.